Your German Shepherd should receive regular puppy vaccinations and it is vital to its future health that these stay current and up to date. 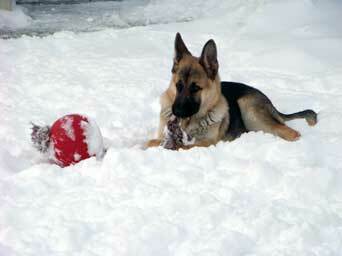 Your German Shepherd puppies health should be of utmost concern to you. You want a healthy German Shepherd puppy that is free of parasites and on good food. Nutrition is very important - especially in the first year of life - but so are vaccinations. There are many diseases that the GSD puppy may come in contact with and it is these puppy vaccinations that helps your puppy to build resistance to these viral attacks. Keep in mind, a little prevention can go a long way to keep your dog healthy. Most vets agree that it is vital to vaccinate puppies at 6 weeks of age and again at 8, 12, and 16 weeks for Distemper, Canine Infectious Hepatitis, Leptospirosis, Parainfluenza, Parvovirus, and Coronavirus (DHLPPC). It is also suggested that all puppies be vaccinated for rabies at six months and then to be repeated annually. Although your German Shepherd puppy may squirm or even cry when getting its puppy vaccinations, it is just as important for your GSD puppy as it is for your children to receive these "annual shots". In fact, by carefully keeping up to date on all your puppies vaccinations, you could be saving its life. Though there are multiple ailments, bacterias and viruses your dog may come in contact with, I will attempt to briefly list and describe only a few of the more common ones in this GSD puppy article that can be prevented with puppy vaccinations. As always, German Shepherd puppy vaccinations are the best preventive method - a little prevention can go a long way to keep your puppy healthy. Parvovirus (parvo). This is a very serious disease. It attacks the intestinal system and is a viral disease in dogs. Parvo is characterized by severe, bloody diarrhea and vomiting, high fever and lethargy. The diarrhea is particularly foul smelling and is sometimes yellow in color. Parvo can also attack a dog's heart causing congestive heart failure. Remember, without medical treatment, most puppies will die from Parvo. Distemper: This disease attacks every tissue in the body and may occur through inhalation of the virus in a contaminated area. Signs of the disease often resemble a bad cold with fever at first though the later stages may result in vomiting, high fever, diarrhea, convulsions and thickening/cracking of the nose and pads. Death is common and dogs and who recover may have future nervous damage. Again, simple puppy vaccinations are the best prevention. Hepatitis. Spread through contact with contaminated urine or feces. This affects the kidneys and liver- often dogs will have high fever, lack of appetite, vomiting/diarrhea with blood, and depression. Often affected animals will have chronic health problems and recovered dogs will pass infected urine for months after infection. Again, vaccinations are the best preventive method. Leptospirosis (Lepto). Affect the liver and kidneys and can be transmitted to man via contact with the urine of an infected dog. Signs such as vomiting and thirst, bloody diarrhea, depression, and jaundice may occur. Antiobiotic treatment is important though the best prevention is through vaccination. Rabies. Transmitted through the saliva of an infected animal, rabies is another disease that may be spread to humans. The disease affects the nervous tissues and causes paralysis and death (always). Again, vaccinations are your best weapon against this disease. Below find a brief listing of other common problems of which you should be aware. Kennel cough. Kennel cough deals with bacterial and/or viral infections in the upper respiratory tract. Symptoms of kennel cough are a constant wheezing cough. Highly contagious as well! Vomiting. Occasional vomiting is not uncommon but consult your vet if the problem persists or if blood, diarrhea or pain accompany the vomiting. Diarrhea. Can be caused by a number of things- viruses, food, internal parasites, and bacteria to name a few. Contact the vet if the stool is bloody, continues for an excessive amount of time, or if dehydration occurs. Once your pup has recovered, return it to its food slowly and in decreased but frequent portions. Constipation. Can be caused by multiple factors also such as insufficient water intake, disease or ingestion of a foreign substance. While your vet may have to take blood tests to find the cause, usually a diet high in fiber and exercise will help prevent this problem. Not to scare you in any way, I do hope this information will assure you of just how important those puppy vaccinations are to your German Shepherd puppies (and your) health. Proper immunizations are the best prevention in the endless war on disease and may save your puppy, and yourself, a lot of discomfort, grief and pain- and possibly even death. Here's to healthy and happy puppy owning.